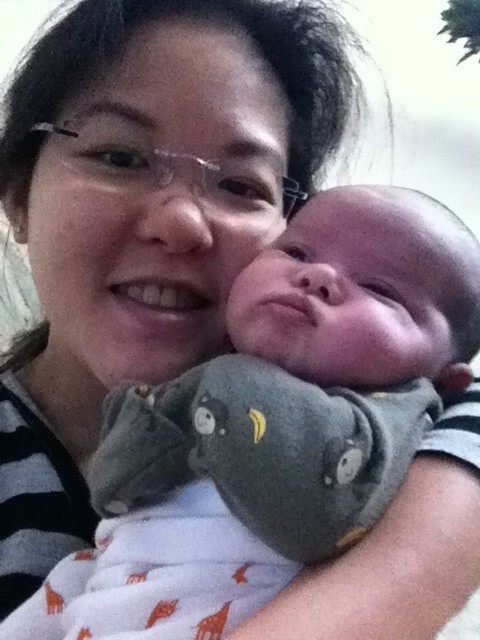 Diane & Jeffrey » Baby Melanie is 1 Month Old! 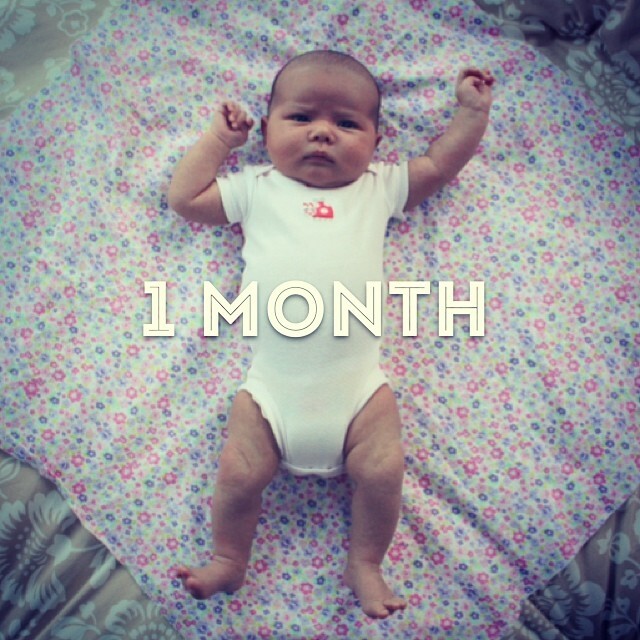 Baby Melanie is 1 Month Old! 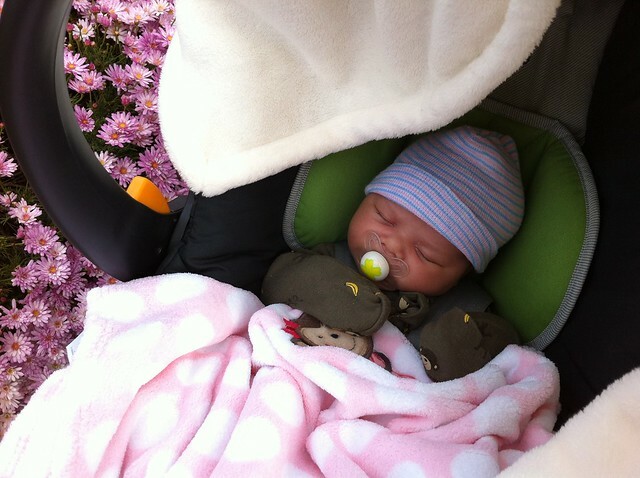 Because of the short month of February, Baby Melanie turned 4 weeks as well as 1 month on the same day. She had her well baby check-up and is gaining weight and looking good despite having a little cold. My parents where here visiting for a couple of weeks and my mom was sick, so i think maybe she got it from her. Then Vincent got sick, then i got sick! Seems that we get sick every month or every few weeks in this household. Hoping the warmer weather will be in our favor. 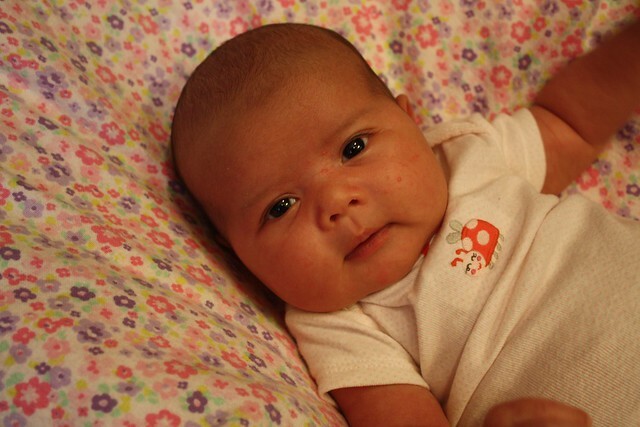 Anyway, Melanie’s stats are 9 lbs, 12 oz (75%), 21.25″ long (50%), and 37.3 cm head circumference (50-75%). She nurses well, despite her making a kind of annoying “clicking” sound with her tongue (doctor said its fine as long as she is not hurting me). She seems to have a pretty good routine of sleeping at night and only getting up every 2-3 hours to nurse, then awake in the morning time from about 8-11, sleeps all afternoon, then up for a short while again when it is dinner time, then back to sleep! Of course she varies on this schedule, sometimes getting up from 2am-4am, which is not fun for me! But really no complaints here. 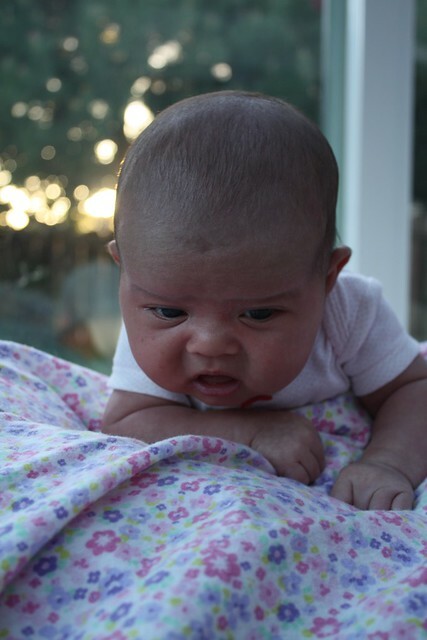 She seeming only cries when she wakes to eat, and when she is feeling gassy/has to poop. Haha! Pooping is hard work i guess when you’re little. Melanie was pretty good at lifting her head when she was only a day old. I haven’t doing as much tummy time as i probably should, but i do put her on my chest and see how far she can lift her head up, and she can go a few good seconds. I’ll work on this more and see how she progresses this month. 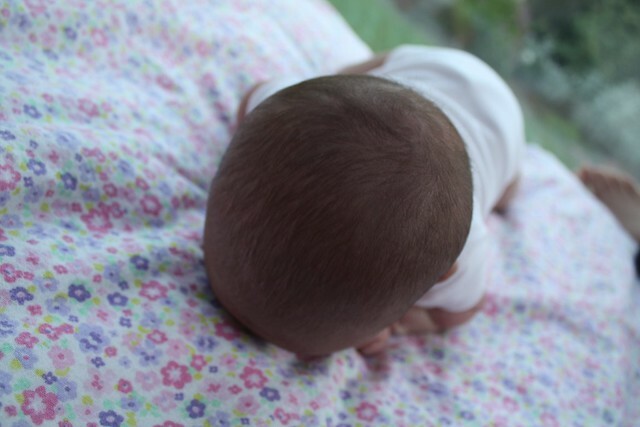 I notice she is already favoring her right side of her head when she is sleeping, and you can see how her head is beginning to become lopsided. Jeff and I are super paranoid about her getting a flat head because of what happened to Vincent when he was an infant. Don’t want to make the same mistake twice! So we are trying to prop her up to lean on her left side when we can. I’ve been trying to balance my time between Vincent and the baby, though right now it is pretty hard to do both especially when i have to nurse Melanie at pretty specific times. But whenever i am not doing that, or comforting her, i do try to play with Vincent and be sure he knows i still love him! I try to get up every morning to get him dressed for daycare — take off PJs, change his diaper, pick/put on clothes, feed the cat, watch some TV while putting on his socks and shoes, then get his snack ready for the car ride to daycare. Dad has been taking him and picking him up after work. 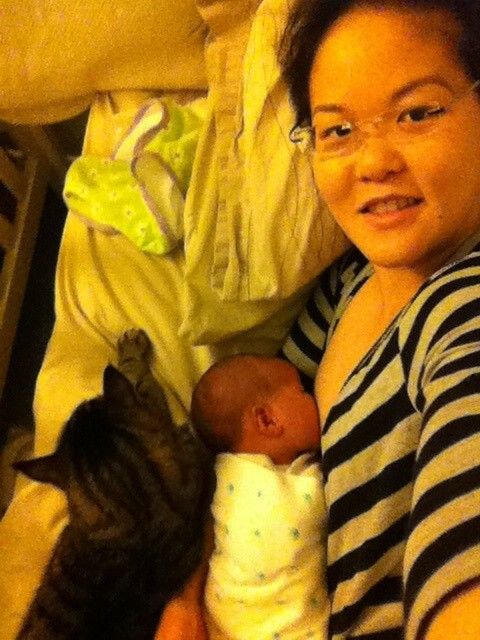 As far as Vincent’s temperament with the new baby, overall he’s doing great. He has tried to push her off of me while i was nursing her once. He often wants me to go somewhere with him when i am nursing, and i try to explain to him that i can’t — but he won’t take no for the answer. Luckily, Jeff will usually come to see what he needs. I’ve watched both kids by myself all day on Monday of this week, because Vincent was getting over a cold and thought better to keep him home. 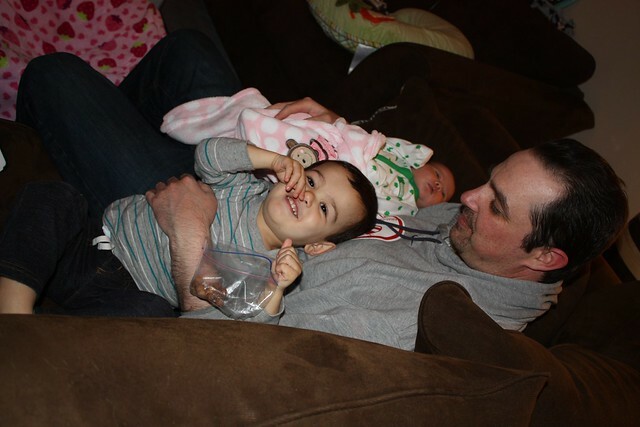 It wasn’t too hard to balance — though i did want to go run him outside, and wanted to keep baby inside at the same time which only worked for a little bit since Melanie started fussing. Butters has been demoted to third fiddle now. Poor guy. He seems to have a case if the meows in the afternoon and it drives me crazy. He has been caught snuggling in Melanie’s bassinet (both when it’s empty and when she’s in it!) and her bouncer. I’ve been trying to go on walks around the neighborhood to get back in to shape. I really hate “watching what i eat” and much prefer to eat whatever i want and exercise it off. I am anxious to fit back into my clothes but at the same time pretty lazy and often times pick a nap over a walk! I can’t believe Melanie is already a month old! 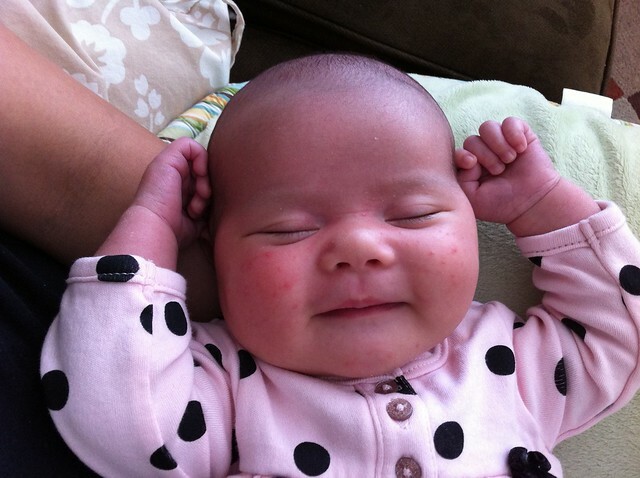 I am looking forward to seeing her smile (not really doing that yet — only sleep or gas smiles) and coo at me. I enjoy spending my day with her. She loves to cuddle and i love to just stare at her! Before you know it i will be back at work juggling 2 jobs and 2 kids!